Half of kids with mental health disorders in the U.S. don't receive treatment. Our Malique Rankin sat down with a family, who says getting the help they need saved their daughters life. Ella McKechnie; 13-year-old: "I'm too ugly, I'm too fat. I don't do anything right." These unkind words others told Ella McKechnie brought on symptoms of depression and anxiety. Mindi McKechnie; Mom: "It was hard, she didn't show anything to me at first, and then kept to herself, started to withdraw, had some issues in school." Ella's mom tried to get her daughter an appointment with a psychologist, but the waitlist was 6 months long. The feelings of depression and anxiety only escalated, and Ella reached her breaking point. Ella McKechnie; 13-year-old: "I got a hate comment on social media. And I was just done with everything. I hated myself and I hated how people hated me. So I went into my mom's bathroom and I took everything I could find." Mindi McKechnie; Mom: "Ended up in the ER. Got in touch with Dr. Kenney, then the ball started rolling faster." Ella's mom says now, nearly a year of therapy later, the change in her daughter is dramatic. Mindi McKechnie; Mom: "She's open, she communicates. We have a better relationship just with her being able to talk things out." Getting Ella back to good mental health has been an emotional journey. Mindi McKechnie; Mom: "I thought I'd lose her at one point. I'm just so glad that we can talk, that she's got somebody else to bounce stuff off of now." About 1 in 5 people will have an anxiety disorder in their life. About 1 in 10 will have depression. Ella McKechnie; 13-year-old: "Now looking back at it, I'm so glad it didn't happen and I'm still here." For Ella, through therapy, she's learned she's not alone. About 44 percent of children in North Dakota don't receive treatment for mental health disorders, according to a study done by JAMA Pediatrics. We sat down with Ella's psychologist. She says often times, people don't receive treatment because of the stigmas surrounding mental health. We asked Dr. Kenney when it's time to get professional help. 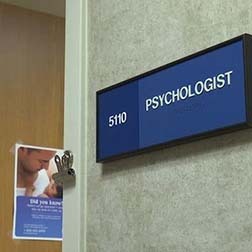 Dr. Sara Kenney; Psychologist at CHI St. Alexius: "I think whenever it gets to the point where it affects your family, how well you're able to get along, the functioning, certainly if it's having an impact on school. And it can have an impact on your health if you're not eating and sleeping well." If the waitlist is long, there are other resources available.